Personality: Kind and gentle to everyone, always wants to please. Very smart and strategic. She can be sensitive once in a while, but manages to be tolerant most of the time. 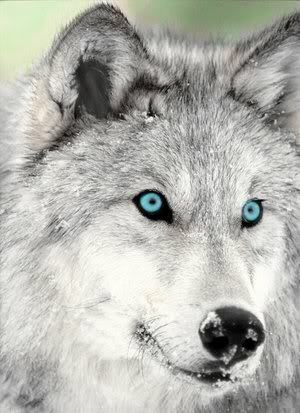 Appearance: Beautiful silver wolf with beautiful blue eyes. She is very skinny so she can squeeze through small spaces during hunts. She isnt very muscular so she isnt a strong fighter, hence why she is a hunter and not a fighter. She has long legs which gives her an advantage when chasing prey. Very nice, though I'll ask that it be a bit more detailed. Perhaps provide a physical description and brief history about her? Once you've done that, she'll be cleared to join the RP. Lovely wolf by the looks of it! Can't wait to read the bio when it's complete ^^"
Okay I edited it. I hope its better this time! Now she's good to go! Can't wait to roleplay with her!